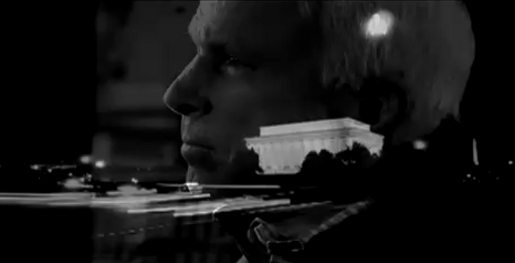 John McCain, in his latest TV ad, Man in the Arena, paints himself as the emerging leader to lead a nation at war, in line with the leadership showed by Winston Churchill and Theodore Roosvelt in the First and Second World Wars. The text for the ad: “The Time Has Come For A Man in the Arena. More Than Aspiration … Leadership”. Images of Churchill and Roosvelt speaking are interspersed with shots of McCain in orator, soldier and prisoner modes, the White House and the Statue of Freedom, and flights through the clouds of Earth’s atmosphere and outer space. The ad finishes with images of young girls with an American flag, picking flowers and running through a field – a reference to the Daisy ad of 1964? May 1940, during the Battle of France.